This war is thought of as one of brother against brother, but seldom did it really happen — here it did. In 1861, the Catoctin Mountains of northern Loudoun separated the areas of sentiment just as sharply as it divided the freestone soil of the Catoctin Valley from the limestone region of the valley adjoining the Potomac River. This low mountain range also separated the homes of two men who would contribute much to the history of a divided County: Elijah V. White, successful farmer of the eastern side, and Samuel Means, prosperous miller, from the western slope. White, whose sympathies lay with the South, distinguished himself in a volunteer capacity at the battle of Ball's Bluff. For his conduct there he was granted a commission as captain in the Provisional Army with authority to raise a company of cavalry. At Leesburg in December, 1861, he recruited a company which became the nucleus of the 35th Battalion, Virginia Cavalry. This battalion was destined to have a distinguished career throughout the war. Means, a Union supporter, had been forced 'to flee into Maryland in July, 1861, and his property confiscated by the Confederates. In March, 1862, he acted as civilian guide for Colonel John W. Geary when the first Federal troops came in to take possession of the County. Unable to return to his home and business, he accepted a commission as captain, with authority to raise a company of cavalry to be known as Independent Loudoun Guards (the name was later changed to Loudoun Rangers). In June, he began recruiting a company from the Lovettsville-Waterford area where pro-Union feeling was the greatest. This company, later augmented by a second, remained in an independent status until 1864 when Captain Means resigned, and the two companies were placed in the Union Eighth Corps. With this background it was inevitable that these two companies would meet in armed conflict. Means had received rumors that enemy forces were in the neighborhood and had placed pickets on all roads leading into the town. The night of the 26th, after checking his command. Means retired to his home in the lower end of the town. (13) leaving Lieutenant Luther Slater in command of the Rangers at the church. Four pickets had been stationed on each of the six roads leading into the town; and two men were sent to the "Arch House" (14) to guard arms and ammunition stored there. These arms had been obtained for issue to new recruits the company hoped to enlist. With this dispersion of the guard and picket there were only twenty-seven men, including the company cook, in the church. Captain White's party eluded Means' pickets by crossing fields until they reached the Holllngsworth barn on the outskirts of Waterford; (15) there White planned his attack. Twenty dismounted men under Captain Randolph were ordered to march down the road and enter the church before firing, or, in the event the enemy was outside the building, to hold fire until Randolph's men could get inside the paling fence that surrounded the grounds. At the first sign of daybreak, Captain Randolph's party approached the church. The Rangers, hearing the Confederates, rushed outside to ascertain the cause of the noise. Randolph's party opened fire before reaching the fence. This premature firing upset White's plan because he had hoped to get close enough to rush in to prevent the Rangers from using the church as a fortress. This first fire took its toll. Fully a third of the defenders were hit. The Rangers, after firing one volley in return, hurried back into the church, carrying their wounded. Lieutenant Slater, in advance of his men, suffered five wounds; and command passed to Drill Sergeant Webster who attempted to rally the demoralized men. The Confederates had taken cover behind the Virts house (16) across the road and in the green adjacent to it. From there they poured a steady fire into the church. Captain White, at the first sound of firing, brought his mounted men own the road, but seeing that the enemy had retreated into the building, fired a few rounds and then continued down into the town in the hope of capturing Means — possibly the principal objective of the entire attack. The sound of the firing had given Means advance warning. When White and his party reached the house, he had escaped. But, the two guards and the ammunition at the "Arch House" were captured. Upon White's return from the town, he sent Mrs. Henry Virts into the church under a flag of truce to demand the surrender of the forces there. Webster refused, and the firing resumed. For nearly an hour the firing continued. Another truce was called. Mrs. Wirts again was sent in with a demand or surrender, only to be refused a second time by Webster "in emphatic language not usually heard in a church." Some of the Rangers' horses had been tied near the well, on the present school grounds, and the Confederates attempted to free them, but as the first Confederates approached, Webster fired from the church vestibule mortally wounding one man. That discouraged further attempts to get the horses. For more than two hours Webster had given his men inspired leadership, recklessly exposing his person as he defiantly paced back and forth across the vestibule. But now conditions within the church were critical. One man was dead, the wounded were lying in pools of blood, crying for water, and the ammunition was exhausted. The reserve ammunition from the "Arch House," which could have changed the results of the engagement, was now in the hands of the enemy. 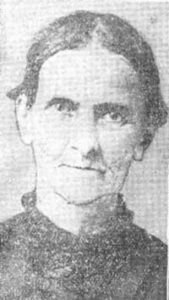 Mrs. Virts approached the church for the third time with Captain White's demand for surrender. This time Webster consulted the wounded Lieutenant Slater, now quite weak from loss of blood, and a conditional reply was sent to the Confederates. The conditions were: "That all in the church should be paroled and released on the spot; the officers, to keep their side arms." To this Captain White agreed'. His own ammunition also was running low. It was now 7 A.M.; the battle had lasted nearly three hours. Quiet again descended on the town. During the fight, four of the defenders escaped from the church, nineteen were paroled (eight wounded are included in this number) one man was dead, (17) another so critically wounded that they did not bother to parole him, (18) and young boy of seventeen who had been in the church during the fight was overlooked. (19) this lad had joined the company only two days before, and being quite small of stature had found it necessary to have his uniform altered by the local seamstress. The Confederates undoubtedly thought him to be a local boy following the soldiers and did not include him in the parole. The two guards captured with the reserve ammunition were not included in the parole because the terms covered only those in the church. The two were carried off as prisoners to Culpeper, where one was paroled. The other escaped from prison. The Confederates had one dead, (20) eight or nine wounded, one mortally. (21) They carried off their wounded without recording their names. White's men withdrew from the town by the main road leading south, taking with them the Rangers' horses, about one hundred carbines and the same number of revolvers. It was a complete Confederate victory except that they had failed to capture Means. Cole's Maryland Cavalry returnee from Waterford. 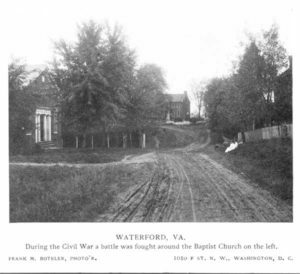 The enemy under Captain White, by crossing the field, avoided the pickets, and attacked about 23 of Captain Means' men in a church at day break this morning, who fought as long as ammunition lasted. One private killed; 1 second lieutenant and 6 privates wounded. Fifteen surrendered (on parole); two. engaged in killing Mr. John, carried away; also 30 horses and all the arms of the company, except those belonging to the men on picket. The enemy lost 6 killed and 9 wounded. Dr. Thomas Bond, the venerable town physician, and many citizens hastened to the church to aid the wounded. The seriously wounded were moved to homes of nearby citizens, (22) while the others were taken to their homes after initial treatment. Many skirmishes were fought near the town but this was the only one within its borders. It was unique in that friend was pitted against former friend, even in one instance, brother against brother. This war is thought of as one of brother against brother, but seldom did it really happen — here it did. After the surrender, one of White's men attempted to kill his brother, a member of Means' force, but cooler heads prevailed to disarm the man. This engagement rated only one brief dispatch in the Official Records, and had no effect on the operation of either army, but it was unusual in the fact that the opposing forces came from the same County, and in one instance even from the same household. (10) For the organization of both Means' and White's commands, and the battle at the Baptist Church, the accounts of Goodhart and Myers have been followed. Both were eyewitnesses of these events and have recorded them in their respective books: History of the Independent Loudoun Virginia Rangers, and the Comanches. Where their accounts of the skirmishes at the church differ, the writer has followed Goodhart for events within the building, and Myers for those outside. (17·18) Charles Dixon was killed at the church, his brother Henry was taken to the home of Mr. Chalmers on the west side of Second Street (now the home of E. L. Crook), where he died five days later. The two brothers were buried at New Valley Church near Lucketts. (19) Briscoe Goodhart who later became historian for his company. (20) Brooke Hays was taken to his native Maryland for burial. (21) Peter Kabrich was cared for in the town until his death on September 21st. He was buried in the Lutheran Cemetery at Lovettsville. (22) Edward Jacobs was taken to the home of John B. Dutton on the east side of Second Street (now the home of Mr. and Mrs. L. M. McGavack), where he recovered. Lt. Stater was first taken to the home of William Densmore (a house since torn down, but then standing on the north side of Main Street at the top of the hill). He was later taken to "Scotland Farm" north of Waterford, and then moved to his father's home near Taylorstown.